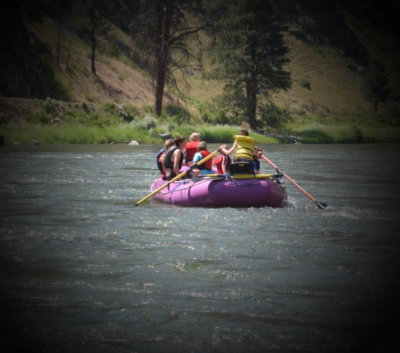 Our scenic floats usually take place near the town of Challis and are offered as full day, half day or shorter floats designed to meet your needs. Our scenic floats are suitable for any age and can be designed to accomodate most any need. We are a small company, so we have the flexibility in planning our trips that others may not. On these scenic raft trips you may float through the cottonwood galleries of Round Valley, where there is good chance to see eagles, ospreys or great blue herons nesting. Other wildlife that you may see on these trips are beavers, otters, mink, deer, elk, and turkeys. As you float by the majestic red bluffs of the Pahsimeroi Mountains you will be surprised to see Canada geese nesting in the cliffs along with raptors. If you're lucky, bighorn sheep might be at the river for a drink of water. Plan your next family reunion or outing with us.